Saturday Synopsis ~ Diane's Vintage Zest! Last week, I mentioned that I needed to sew a bathing suit for this weekend's festivities. Unfortunately, I didn't have any time to get it done. Lucky for me, the plans were switched to a housewarming and BBQ instead. Awesome! Now, I just need to get a waistband inserted into the dress that I sewed a few weeks ago in preparation for the mimi g. convention. 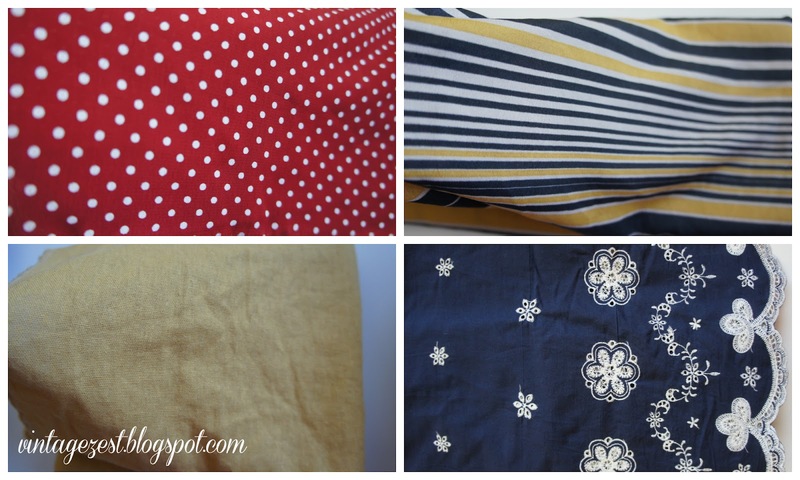 The fabric that I used (top right) was bought way back in May. It's a small peek now, but I promise to share the finished garment soon! Monday: Super easy and delicious grilled fish tacos. Yum! Tuesday: My crack at refashioning the black & white top I made for the Black & White challenge. Verson 2.0 is so much better! Wednesday: Tons of inspiration plus more delicious food. Lucky me!